So far, we have seen different features you can use from the Order Delivery Date Pro for WooCommerce plugin for various types of businesses like cake shop, grocery product, food products and so on. Such businesses like Cake shop can do only a limited number of deliveries per day. And they want that the customers cannot place more orders than the limit for a particular day. So the date should be disabled for further deliveries in the calendar. For example, you have cake shop where you can deliver only 10 cakes per day. 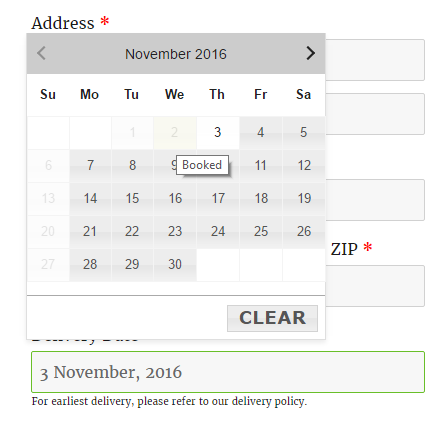 And you want that the date should be disabled for further deliveries in the calendar after 10 orders have been placed for a date. So you can set this up in the plugin. You can find the setting for limiting the orders per day under Order Delivery Date -> General Settings -> Date Setting. If you have online Flower bouquet shop where you can only deliver 10 bouquets each day. So you can set Maximum Order Deliveries per day (based on per order) option to 10. Once 10 orders are placed for a date, the date will be disabled in the calendar for further deliveries with a label as Booked. For example, on 2nd November 10 orders are already placed and the Maximum Order Deliveries per day (based on per order) is also set to 10, then the date 2nd November will be disabled in the calendar with Booked label. In the above example, we saw how you can limit your deliveries per day using Maximum Order Deliveries per day (based on per order) option from the plugin. The feature is useful for the businesses who can deliver only maximum deliveries per day. You can also use WooCommerce to create a full restaurant ordering system with our Order Delivery Date plugin. For instance, you can restrict number of bookings within each time slot to prevent over-bookings. You can also set a minimum time before which customers must place orders for their time slot. We will be discussing how you can limit deliveries for time slots in our next post.